I get a lot of traffic to this blog for people searching "red houses" and "certainteed barn red siding." They come because of an image on the post at this link. In fact, a lady in Ohio sided her house with barn red siding after seeing pictures on this blog of the transformation of our house. Because so many people come here looking for barn red siding and Certainteed siding I thought I should share the continuing journey with our siding choice, and not just from the designy perspective. 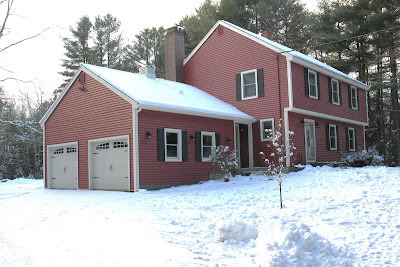 We sided our house with barn red Certainteed Vinyl Siding. We went with that company at the recommendation of our contractor, even though it was more expensive than the other choices we were looking at. The contractor said he had only had issues twice in the many years he has been installing Certainteed Vinyl Siding. He said that each time the company was great to deal with when problems arose. We wanted to get it done and know it was done well and any issues would be covered by their guarantee Their brand is a combination of the words Certain and Guaranteed. Great marketing, especially if you follow through with the guarantee. Last year my brother noticed that the back side of our house had some wavyness in the siding and said, "That is not how your siding is supposed to look." This is called oil canning. So in September I contacted the contractor who contacted the distributor who contacted Certainteed who sent us a letter saying they were sending a field rep to look at our issues. The field rep cam in mid October to assess. He took a piece of our siding (which was all from one lot) to take it to headquarters to test it. He compared the back of the house (sunny side) to the front of the house (non-sunny side). Anyway, we are waiting for Certainteed to test the siding and get back to us. It will be too late for repairs to be made this year. I am hoping for next spring, though. 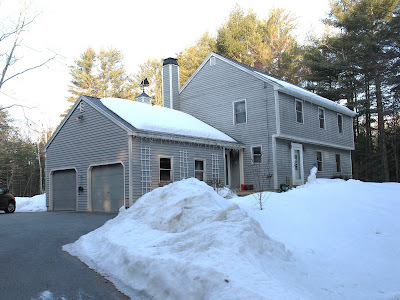 I thought it was right to share this as so many people come here searching for barn red siding and Certainteed Vinyl Siding. I'll keep you updated and will tag all the posts in one spot for the convenience of people who are looking at siding. You can read the other posts about the siding process by clicking here.